There are many similarities between the original self-realization, spiritual experiences of the founders of all religions. We say "original" because religious doctrine for most religions has changed much over the years. This is because followers and religious leaders re-interpret the original teachings based on their own views. This leads to factions, and sects within the religion. Of course the Abrahamic religions, Christianity, Judaism and Islam are the most notable factions within what was once a set of core beliefs... the early Bible being the basis for much of these beliefs. All of these religions share pretty much the same view of God with some variations. And if it weren't for Christ's and Muhammad's influence perhaps these might still be considered one religion. Here's some core beliefs that most religions share. One must do good, and avoid evil and other "bad" practices. In other words, "love your neighbor." There is basically one God. God must be worshipped, and "surrendered to" in some form. After that there is little agreement on the details between religions. Yet one could argue that the self-realization experiences of Jesus (Christianity), Siddhartha Gautama (Buddhism), Muhammad (Islam), Confucius (Confucianism), Lao-Tze (Taoism), and many, many others could well have been the same as a self-realization or Enlightenment experience. It seems logical doesn't it? If the "enlightenment" experience (or salvation, samandi, satori, self-realization) is really the same for all, then clearly all mystics arrived at a similar place. The only "religious" differences being the descriptions, and historical writings of that experience usually by followers. And if that description was actually written down by followers and disciples, and not by the actual experience, then it's easy to see how there could be differences in the interpretation of that experience. Especially if that experience is difficult to describe in words‚ not to mention understand. Therefore we have the range of beliefs and dogma ascribed to the major religions. The differences may amount to inadequate historical records of the same experience. And because the experience may be indescribable in the first place, this confusion is logical and even to be expected. Some believe God is out there, and some believe God is within all living things. Christianity sees God expressed as the Father, Son, and Holy Spirit. Judaism says that there is one God. Hinduism says God is one, but expressed in many different forms through hundreds of gods and goddesses. Furthermore, Hinduism believes in reincarnation where the soul continues until enlightenment, or "one-ness," with God occurs. Buddhism sees no reason to describe God at all. However, Buddha ism believes that the goal is to achieve the state of Nirvana, which is a condition, and not a place such as either Heaven or Paradise. Islam says that there is one God. Abrahamic religions see God as being in heaven, and judging us. Hell is the result of either an unrepentant evil/sinful life or not wanting a relationship with God. But how do "the people" really view God today? Yes religions have their "position" on the subject. But when you ask regular people how they have come to interpret these views in their own everyday lives what do they really think? This God is involved with daily life and world events, and can be angry and punish the unfaithful. Deeply involved with daily life and events, but is mainly positive and less willing to punish. This God does not interact with the world, but is unhappy with the current world, and will ultimately exact judgment. This God is more of a cosmic force who does not interact with the world, but set the laws of nature into motion. When asked about the question as to allowing prayer in schools, here's how people who viewed God in these 4 ways responded. I'll leave it to you to draw your own conclusions about these results, but it's clear that most Americans have some very divergent views of God, and how their God views morality in today's world. And the reason that Americans have such divergent views is the simple reason of not knowing God. The Bible is the only religious book that explains His nature, "who He is," how He expects us to honor Him, and how He expects us to conduct ourselves while on planet Earth. And that is the reason why we prepared the SPECIAL REPORT, The Creation Of The Holy Bible -- The Holy Scriptures. The sole purpose is to give you confidence that the Bible is the inspired Word Of God. To order, click onto the picture. And the reason that Americans have such divergent views is the simple reason of not knowing God. The Bible is the only religious book that explains "who He is," how He expects us to honor Him, and how He expects us to conduct ourselves while on planet Earth. 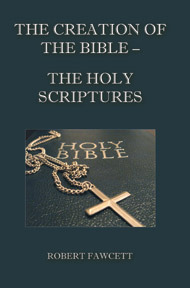 And that is the reason why we prepared the SPECIAL REPORT, The Creation Of The The Holy Bible -- The Holy Scriptures. The sole purpose is to give you confidence that the Bible is the inspired word of God. To order, click onto the picture.